Preheat the oven to 200°C, gas mark 6. Place a 300g pack Waitrose Cherry Vine Tomatoes on a baking sheet, drizzle with 1 tbsp olive oil and 2 tbsp balsamic vinegar, and roast in the oven for about 10 minutes. Cut 4 diagonal slices, about 2cm thick, from a white French stick, rub with olive oil and bake alongside the tomatoes. Fry ½ x 70g pack Waitrose Farm Assured Salami Milano, then slice into strips. 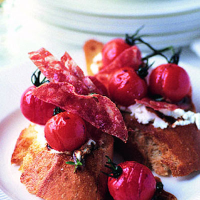 Spread a 100g pack Pant-Ysgawn Farm Goat’s Cheese over the toast, top with the tomatoes, then the salami. Garnish with a few fresh sprigs lemon thyme and a drizzle of the sauce from the cooked tomatoes.